An American dream – For the fainthearted . . . 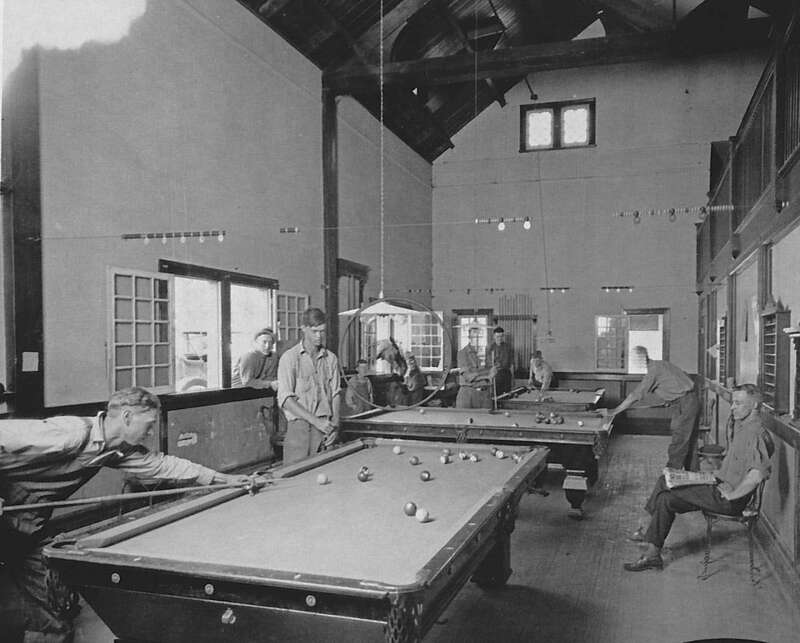 The December 2014 edition of National Geographic magazine has a photograph from the archives – the billiards room of a campground outside of Denver, Colorado, taken in 1922. The magazine notes the photograph because a casual glance might mean one misses a background detail, the head of a horse that has presumably been pushed in through an open window in anticipation of human reward of some sort. As one who grew up in England in the 1960s, every detail of the photograph is remarkable. 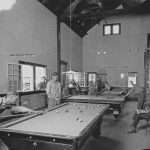 National Geographic notes that the billiard room was one of the facilities on the 160 acre campground, in a building that included a reading room and showers, to cater for vacationers travelling through the state of Colorado by car. In a wonderful piece of understatement, it says 247 campgrounds were opened in the state that year. The comfortable and spacious timber-walled billiard room would have been an attractive facility fifty years later, the young men might have been dressed differently, but not much else would have changed, even the electric lights might have been similar. The photograph raised so many thoughts, “vacationers”, “cars”, “campgrounds”, even “showers”. This was 1922, this was the year Ireland became an independent state, a state in which many people still lived in 19th Century conditions. Things in England were not much better, people might watch Downton Abbey and ponder the opulent lifestyle of the extremely affluent, but even they were living in the past compared with middle class Americans, heading west with their motor cars and tents and expecting comfortable facilities for their vacation. One of the most striking features is the way in which the young men are dressed. Look at photographs of people on holiday in Britain of the 1920s and it is rare to see men without a jacket and tie (working in Northern Ireland in the 1990s, there were still men who would come on parish outings in suits and ties). The American young men in the 1922 photograph are dressed in open necked shirts and baggy cotton trousers; it is hard to imagine anything more different from the clothing of their middle class counterparts across the Atlantic. Perhaps the United States had not become bound by social convention; perhaps the impact of the Great War had been a loosening of definitions of what was appropriate; perhaps young men playing pool in a campground billiards room were part of a world that would include jazz music and a shift in attitudes on morality; but Colorado campgrounds in 1922 seemed to have more in common with Europe of the late 20th Century than with a Europe still stunned by four years of war. Of course, the Hungry Thirties were still ahead; the “Hooverville” shanty towns built during the Great Depression, the Dust Bowl caused by drought and soil erosion; there were plenty of bad times to come, but a moment on a campground in Colorado captured forever in a black and white photograph seems not such a bad time and place to be.